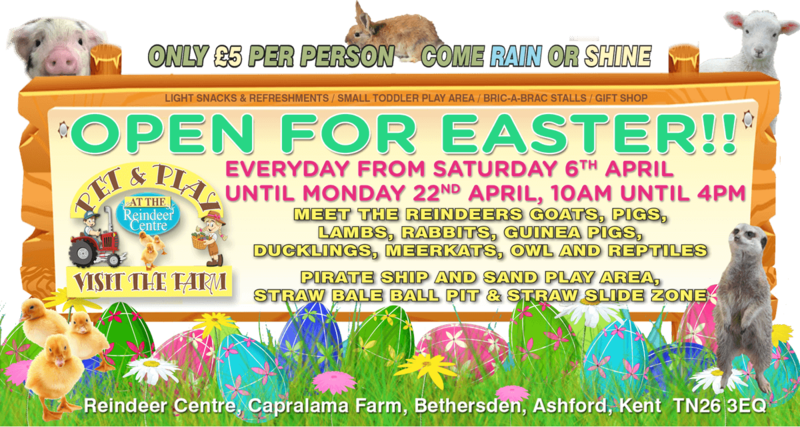 Come and visit this Easter, there’s lots to do at The Reindeer Centre. Meet the Reindeers, Goats, Rabbits, Ducklings and much more plus there’s a play area and lots of other activities plus a new picnic area. Entry is £5 per person, under 1’s go free. We imported a few reindeer from Sweden some 15 years ago and now have in excess of 100 reindeer thanks to our successful breeding programme. We can cater for occasions of all sizes including Corporate Functions, Garden Centre Promotions, Shopping Malls/Centres, Christmas Events, Private Parties, Weddings, Photo/Magazine Shoots, Television Work, Children’s Parties, Town Centre “Christmas Lights Switch-on” and Opening Parades and School visits. Come and visit the farm over the summer, there’s lots to do at The Reindeer Centre. Meet the Reindeers, Goats, Rabbits, Ducklings and much more plus there’s a play are many more activities including a new picnic area. We have available for hire a selection of farm animals for your Nursery, Schools, shopping centre, fayres/fete and childrens parties, or just for your own pleasure. We are experienced livestock farmers and our aim is to enable children and adults alike to enjoy and experience the delights of animals and create interest, enjoyment, confidence and respect for each other.